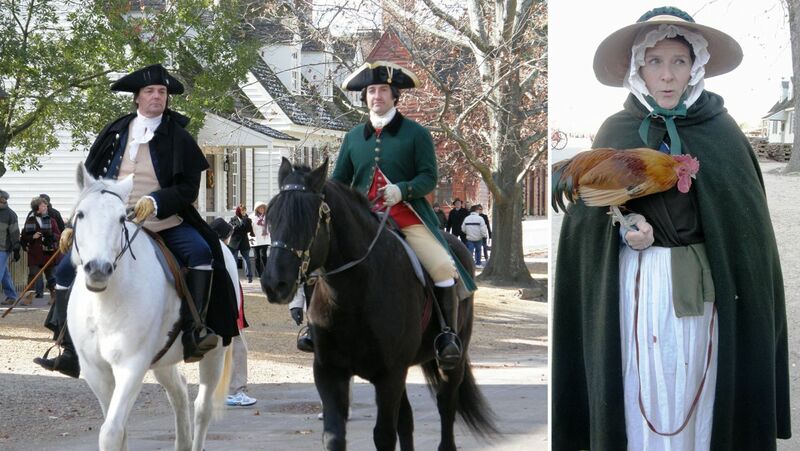 Colonial Williamsburg is “the restored 18th-century capital of Britain’s largest, wealthiest and most populous outpost of empire in the New World. The challenge I faced was the COLD! It was not quite what I am used to in hot and steamy Santa Cruz Bolivia. 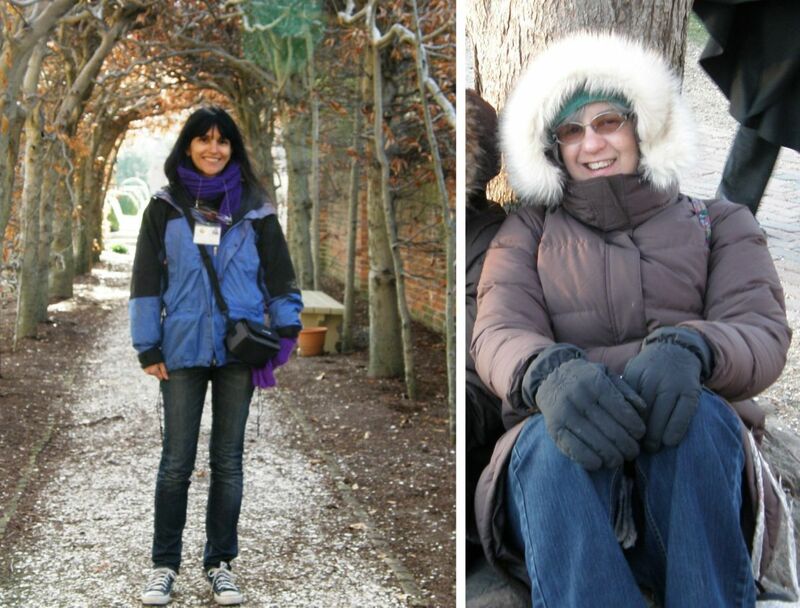 It was interesting to note yesterday that the temperature was the same here as in Bolivia – around 34 degrees – except that the temperature here was in Fahrenheit while it was in Centigrade in Bolivia. 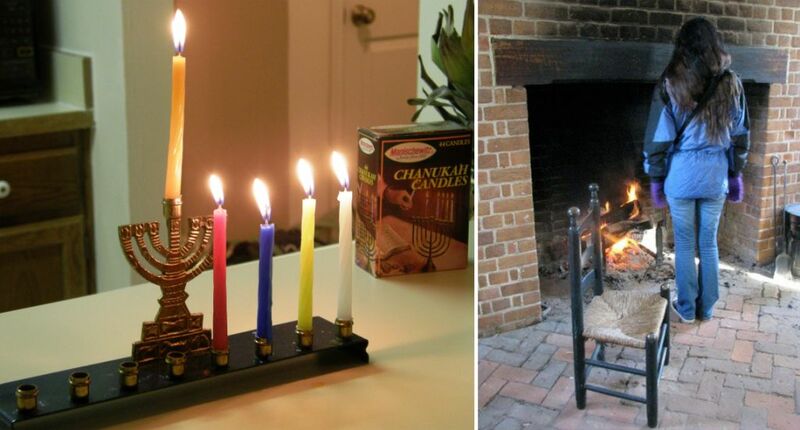 It was a week of flames…candles, fireplaces and burning braziers in the streets after dark. It was COLD! and I made friends with every fireplace in every building along the way and became a big fan of hot cider. We stayed at the historic Powhatan Plantation which is named after Chief Powhatan of the Powhatan tribe and father of Pocahontas. I had wished for snow and there I got a dusting on the morning of day one. That was enough for me, thank you very much! A week of glorious clear blue skies followed. Above you can see the plantation Manor House and kitchen building which is now an intimate elegant restaurant. I don’t know what kind of awful weather in Canada has the geese flying down here to happily set up camp on the frozen ponds. 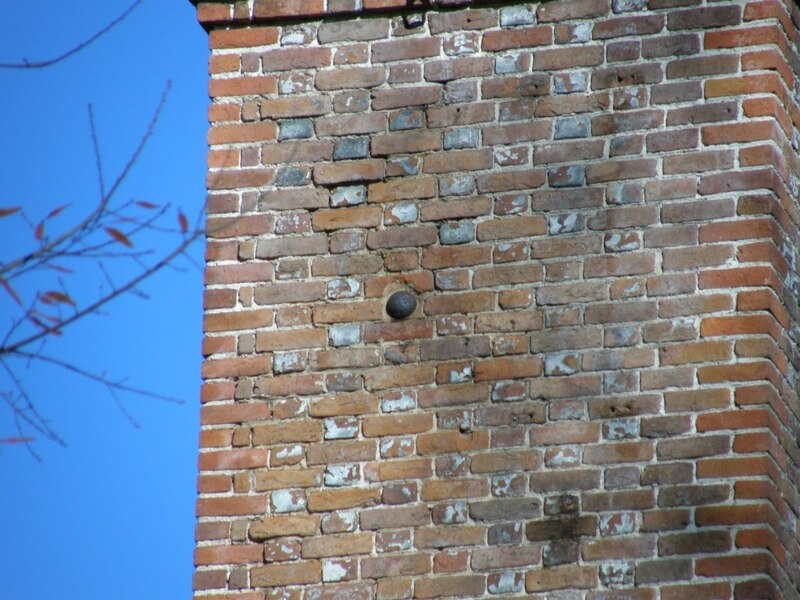 The Manor House came complete with a cannon ball lodged in its chimney and resident ghost Eliza. Walking from place to place around the historic area and visiting every single place that was open to the public, we managed to keep ourselves warm, quite often forgetting the cold all together – everything was so absorbing and interesting with the constant reminder that we were walking the same floors, visiting the same stores, climbing stairs and grasping the same banister rails as people like George Washington, Thomas Jefferson and Patrick Henry. Only Sunday evening had us sitting still and huddling down against the cold as we waited for the “Grand Illumination” – a tremendous fireworks display which marked the start of the holiday season. Large blazing braziers lined the streets and groups gathered around in the darkness for light and warmth. Forgive this photo – we don’t have squirrels in Bolivia. 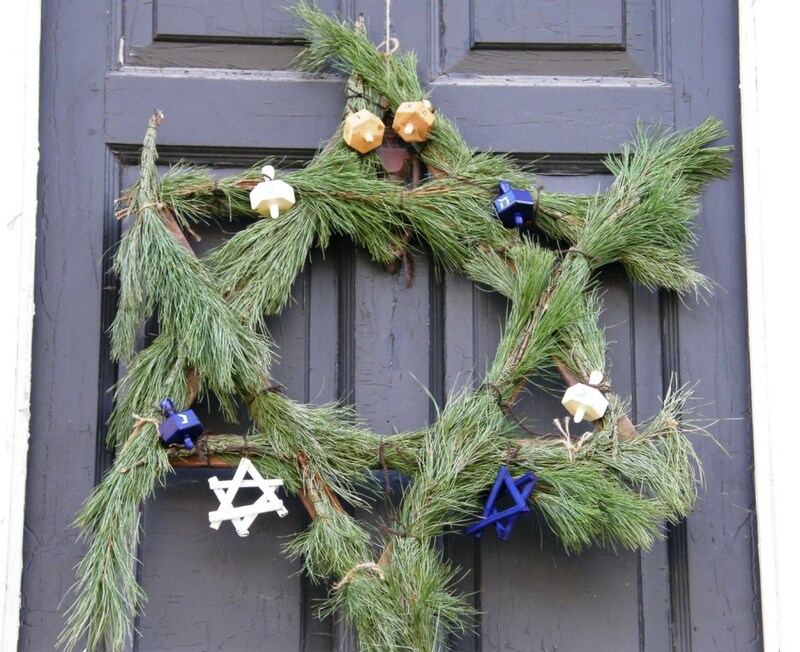 Doors, windows, shutters, fence posts and walls were adorned with wreaths – no two were alike, some pretty, some just plain quirky – candles flickered in windows and carol singers gathered on street corners while horses and carriage clopped by. 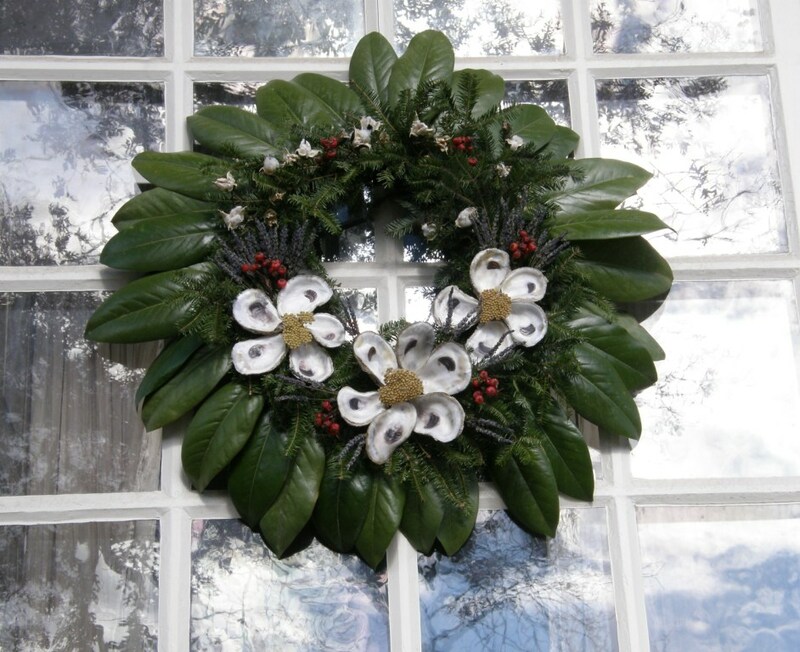 I have inserted tiny pictures of just a few of the wreaths throughout this post. 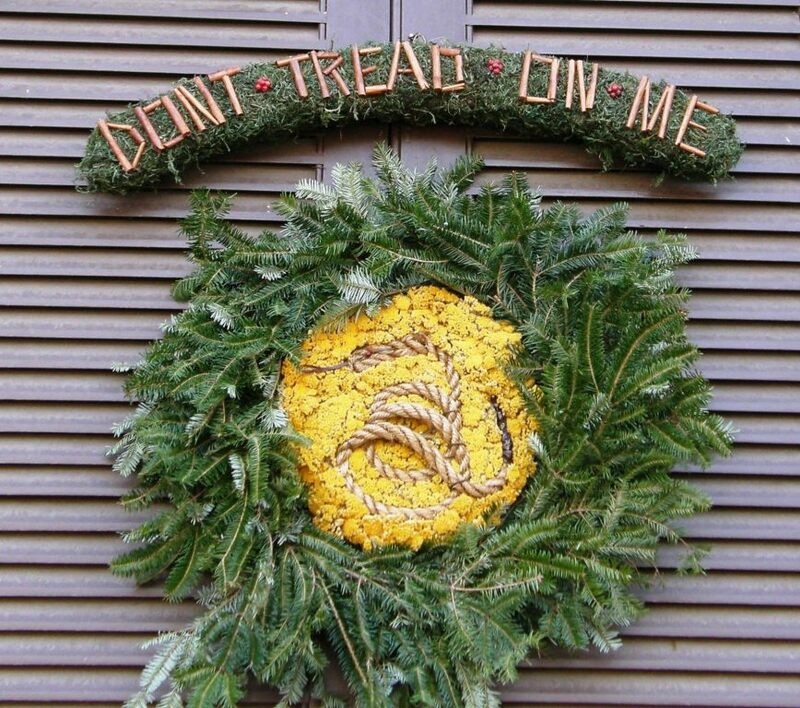 As idyllic as this all sounds, this swinging sign outside a private residence of colonial Williamsburg with its hung effigy of who was, most likely, Governor Dunmore shows that not all was well in the colony around the 1770s. Indeed, we heard snippets of gossip and rumor from the various store, tavern and coffee house keepers about the general discontent with the British Government and its taxes. There were even whisperings of “independence”. The vast majority of the interpreters stayed faithfully in character and it was fun interacting with them. Of course we had to pursue the fiber trail which took us to the workshop of the weaver and spinner and out to the pastures to find the Leicester Long Wool sheep, one of the breeds known to have been raised in these colonial times. This image from a website called Sheep 101 and the reproduction of a children’s toy in Williamsburg clearly show how this breed of sheep earned its name. We eventually tracked down a half dozen LLW sheep in one of the pastures and saw some of the handspun wool on sale in one of the stores. According to various pieces of literature that I picked up here and there in Williamsburg, most colonists bought fabrics imported from England from the local milliner. However, those who could not afford these or who had very large households produced their own cloth. 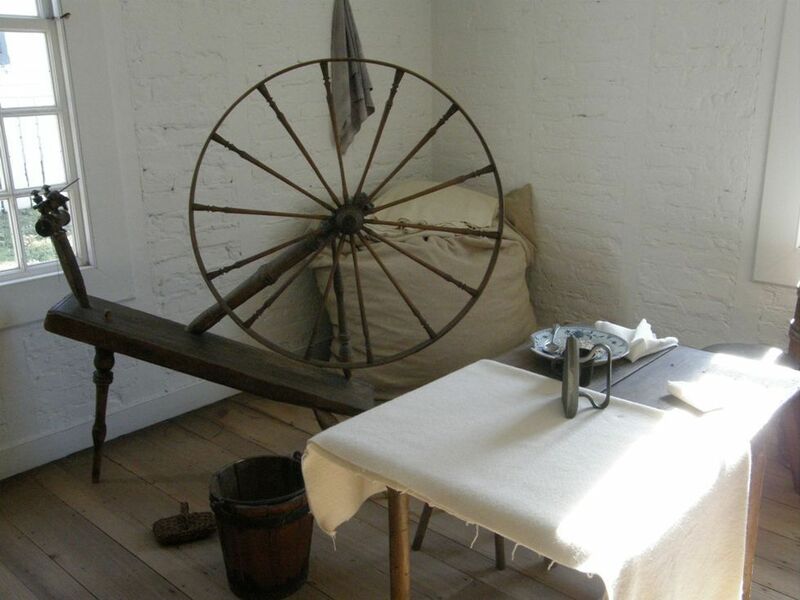 On plantations around Williamsburg, the work of growing, combing and spinning flax into linen yarn for weaving usually fell on slaves or domestic servants. The additional labor of raising the sheep and carding the wool and cotton would go to the slaves who were now clothed in “Virginia cloth” instead of imported English fabric. 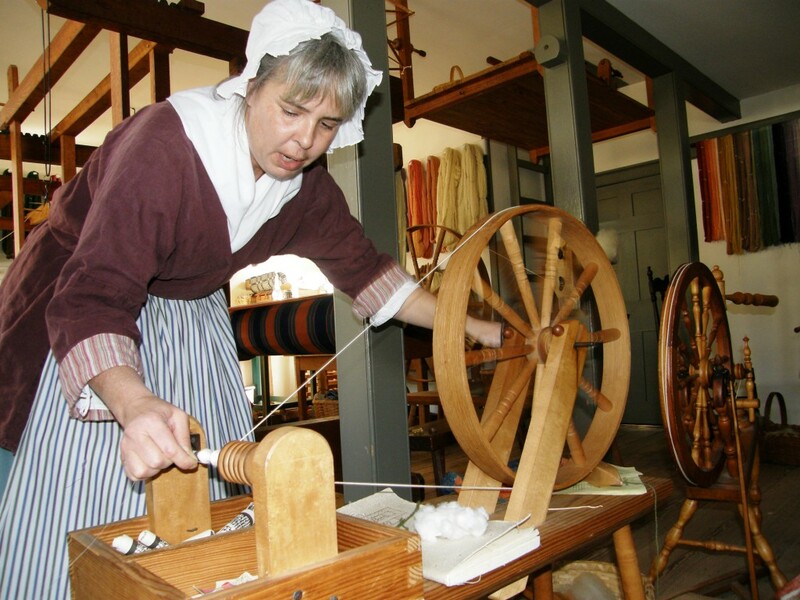 Weaving, spinning and dyeing became necessities and patriotic duties. We visited weaver Max and spinner Karen more than once as, on each visit, they had different interesting tidbits of information to share. In fact, you could probably visit all the tradespeople in town several times over and learn something new every time. None seemed to have limited themselves to a set well-rehearsed speech for the visitors and their enthusiasm for their work was evident. Karen showed us her Saxony and walking wheels while Max was reproducing an antique blanket woven in overshot for a client, a piece of which can be seen draped over Karen’s spinning wheel. While Karen wound quills as you can see above, she told us that children would be tethered to the equipment to perform the tasks of loading shuttles and winding the quills. Above left is Bruton Parish church, completed in 1683, where we attended an evening concert of Christmas songs ranging from pilgrim songs of the 15th century to jazzed up versions of twentieth century tunes. 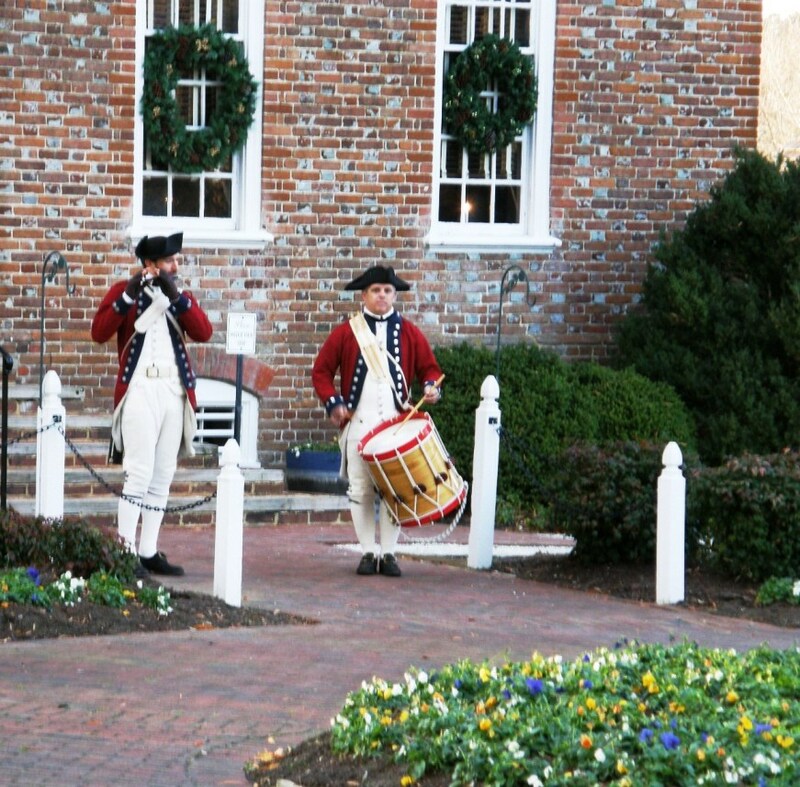 The Williamsburg Courthouse, on the right, is the only building we didn’t enter but we did try the stocks on for size. You can just make them out on the right. The reconstructed Capitol building. The Capitol building was the center of political life in Virginia for most of the eighteenth century and is where Members of the House of Burgesses met. 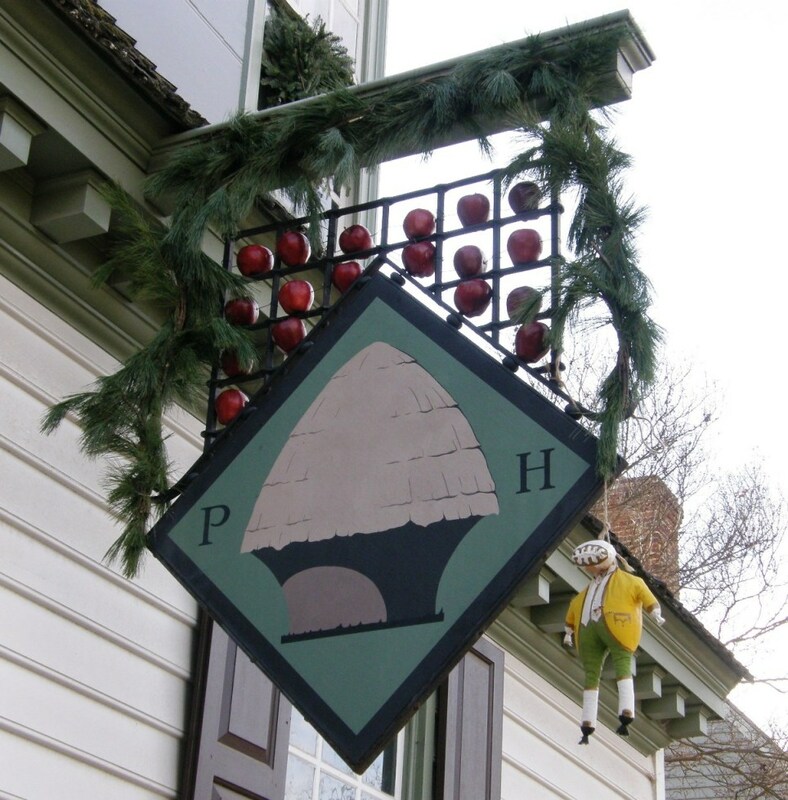 it was here that Patrick Henry delivered his “Caeser-Brutus” speech against the Stamp Act on May 29, 1765. Private homes and stores in the historic area. 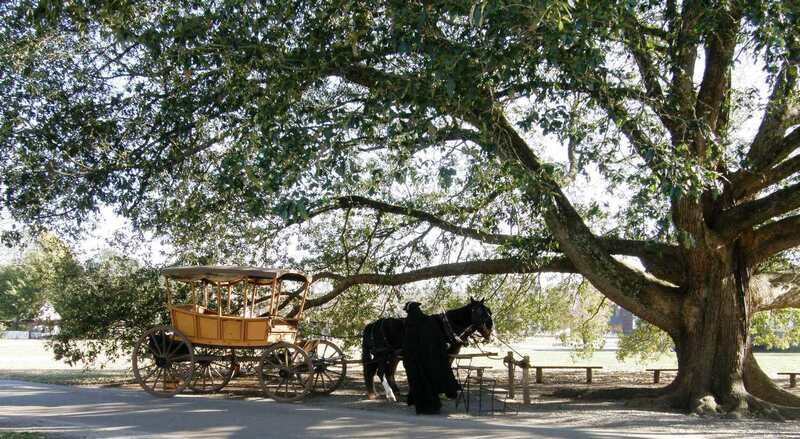 A carriage pulls up under what we were told is a majestic willow oak. 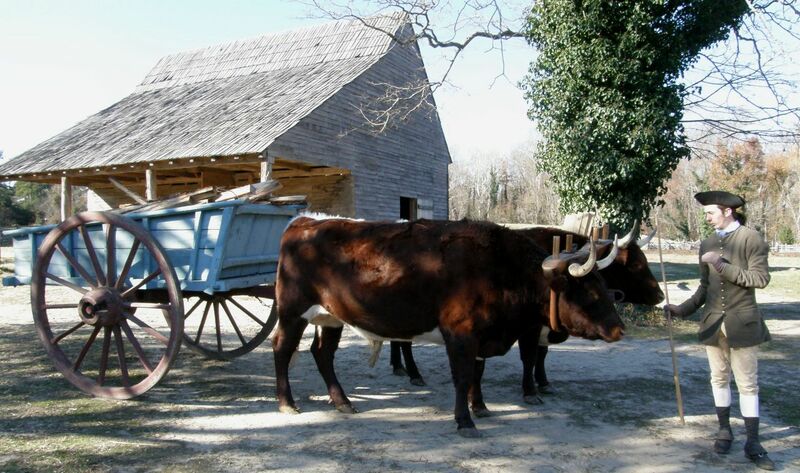 Ox and cart on Hope plantation where tobacco amongst other crops was grown. We encountered all manner of folk in the street. 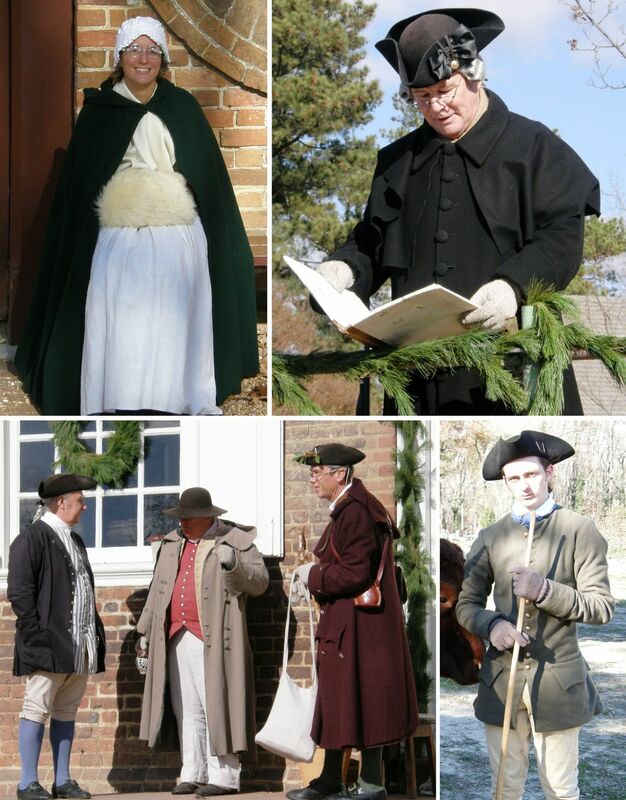 An actor plays out a scene from Sheridan’s School for Scandal and a group sings carols for passersby. The gardens of the Governor’s Palace were particularly beautiful even in the wintry weather. The kitchen gardens flourished despite the low temperatures and frosts. My favorite places were the workshops of the various tradespeople. The blacksmith was working the bellows and beating out an ax head. The visit to the seamstress’s shop gave us a chance to see some of the fabrics that were in fashion in the 18th century as well as some examples of the handstitching. My immediate reaction was to marvel at how someone had managed to work stitches by hand so perfectly that they resembled machine work. I then realized how stupid that was when reminded that machines were built to try to speedily replicate the perfection of hand stitching. The wig makers at left were a fun couple with a lot of jolly banter between them and a witty comeback to every comment and question from the visitors. The brick kiln was being fired up for a restoration project. I was wondering how on earth they were going to slide all the bricks within when I realized that the kiln itself was built from the very bricks that were to be fired. The basket maker was making containers from white oak, a hard task for the hands in those low temperatures. The printer and shoemaker. It was interesting to see the font that the printer was using which included different forms of the letter “s” depending on where it was placed in a word. 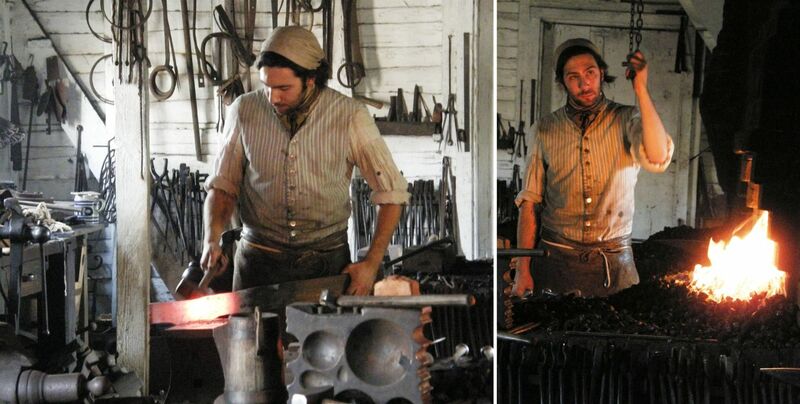 We learned a little about silver smithing and also visited the cooper, wheelwright, joiner, cabinetmaker and gunsmith. At the cooper’s it was interesting to see the amount of work and precision that went into making a simple wooden bucket, cutting pieces that fit together so perfectly in order to make the piece completely watertight. It was very surprising for me to pick up a musket at the gunsmith’s and find that it weighed as much as 8 pounds. The apothecary was a favorite of mine with its strange mixtures in exotic-looking bottles and jars and herbal remedies for all manner of ailments. One of the highlights of the week for me was going into the historic area after dark to walk with the entire Fife and Drum Junior Corp as they marched and played along Duke of Gloucester Street accompanied by flaming torch bearers. It was such a powerful sight in the darkness with the torches casting their orange glow over everyone. The onlookers were completely hushed in awe. Two members of the senior corps played at sunset at the manor house on the plantation where we were staying. that which is produced by an indigenous culture or by peasants or other laboring tradespeople. It is an unsophisticated art which is supposedly rooted in the collective awareness of simple people and reflects the traditional values of a society. 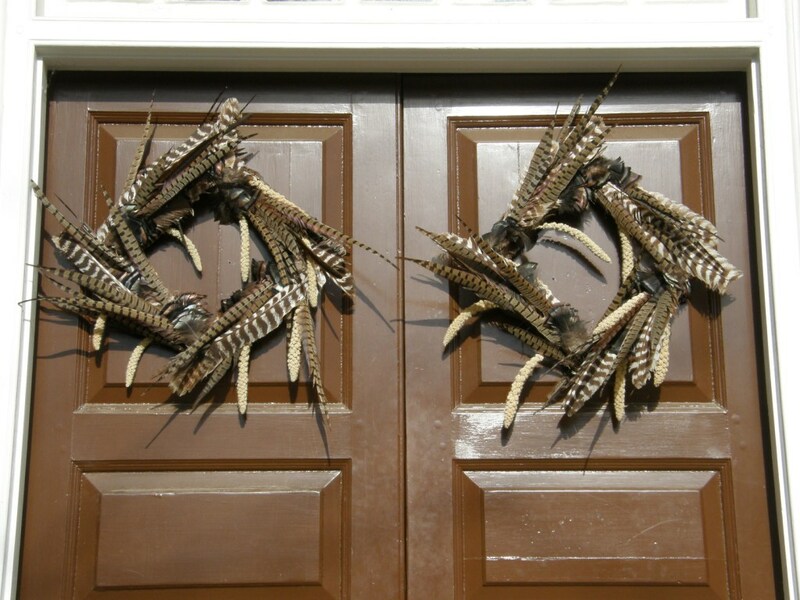 Here are a few pieces that were easier to photograph that caught my eye on my brief visit. 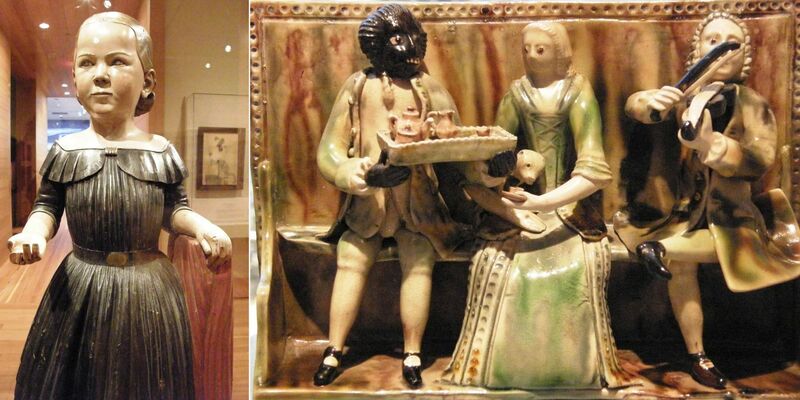 I particularly like things like the piece on the right that capture a slice of life. On the left you can see the signature of coverlet maker David Haring on his double weave coverlet made with white cotton warp and weft and blue wool warp and weft. The figure on the right is called Mr Nobody and apparently is the fellow in the household who is blamed for all that goes amiss. 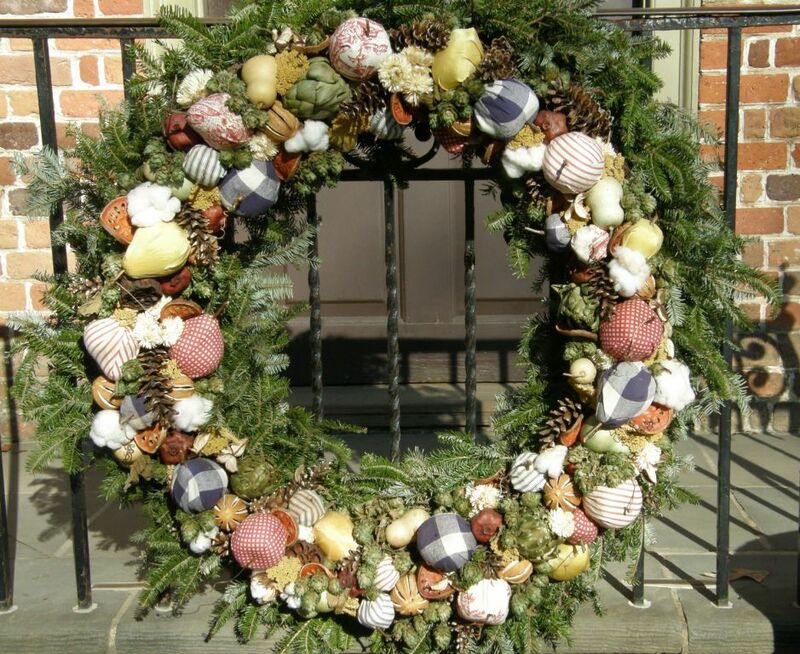 Part of the folk art collection had been originally used to decorate Bassett Hall, the twice yearly residence of the Rockefellers in Williamsburg. It was Abby Aldrich Rockefeller’s husband, John D Rockefeller Jr., who we have to thank for financing the return of Williamsburg to its eighteenth century aspect. I have a few more things to show about my visit with the Montagnard (Vietnamese hilltribe) backstrap weavers a few weeks ago which I wrote about here and here. A local church has kindly allowed Betsy and the weavers to use their space for weaving get-togethers and demonstrations. On a second visit there we were able to address the first challenge which was to find a place in the church where several weavers could tie up their backstrap looms at once as well as set up the foot braces against which they like to push to increase tension on the warp. The large piece of bamboo that you can see in the photo with some screws and rope did the trick. Khin joined us on this visit as translator and weaver. She said that she had not woven in at least twenty years and was a bit unsure about picking it up again. Ju gave her a few pointers and she was on her way looking and feeling completely at home in the loom. Of course now she wants her own loom and is thinking big…she is already planning a skirt as her first project. My twining teacher, Ngach, arrived later and also gave Khin some tips. A local nun, Sister Gretchen, dropped by and brought a collection of blankets that have been gifted to her by people in the Montagnard community over the last ten years. She is keen to have them identified by tribe and to have them out somewhere on display. There were some pieces there that were quite unlike anything I had seen made by Ju or Ngach. Nagch was very pleased and proud to identify one of her own blankets in the collection. 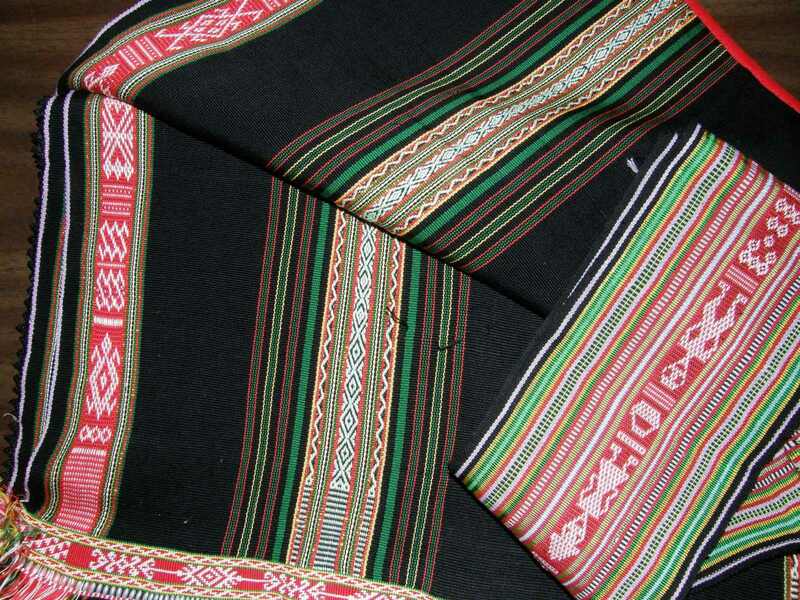 This heavy blanket caught my eye, not only for its lively red and blue pattern and the fact that it is white (you may have noticed that the Montagnard use a lot of black in their work), but for the band along its edge. This is not twining. 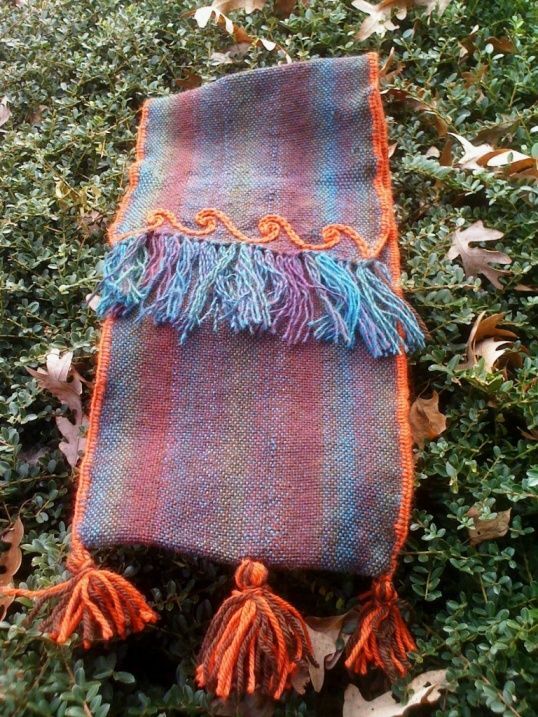 It seems that the blanket was woven on a backstrap loom and then somehow the warps were used as weft to weave a warp faced band across the bottom of the piece. 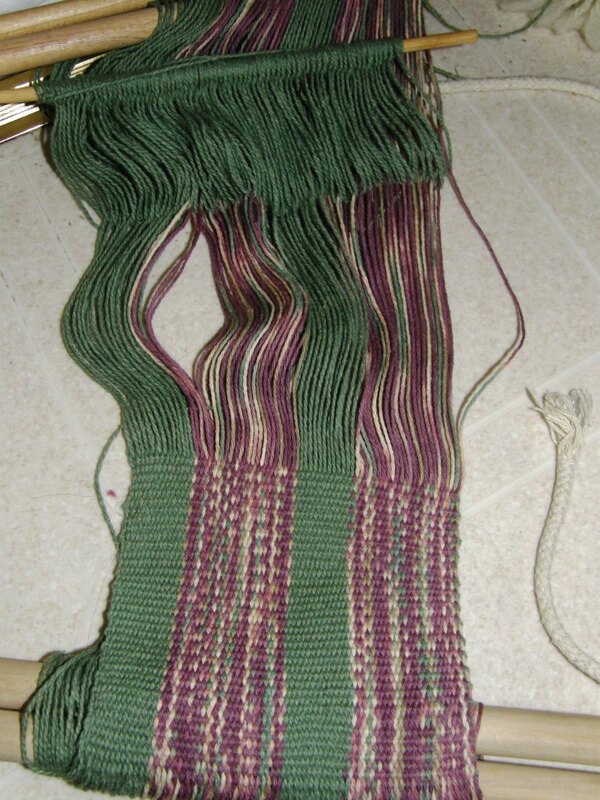 Three warps are used as a single weft. You can see that there is some puckering in the blanket where some adjustment in the number of warps used for at least some of the weft passes should have been made. I have been trying to imagine how this could have been set up. 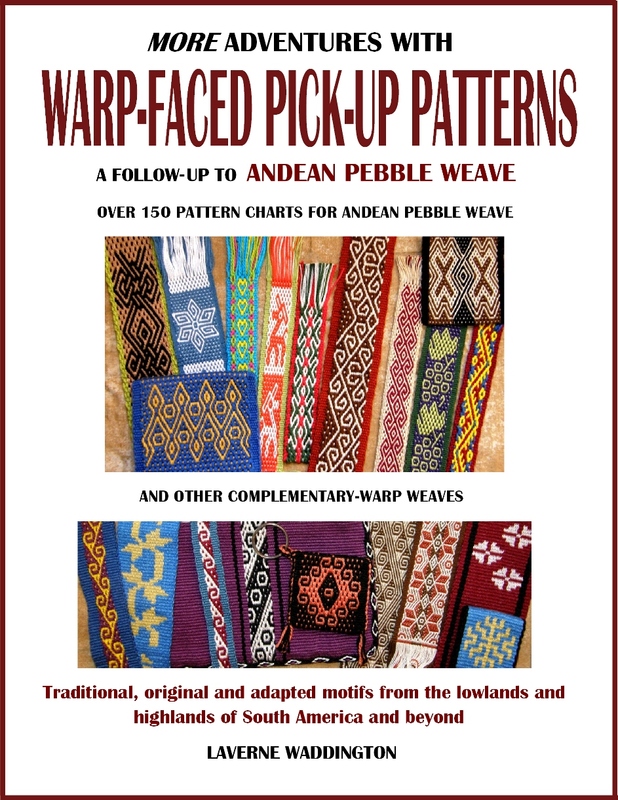 I could see myself first weaving a narrow warp faced band passing my weft through a shed and extending it out and around a post some meters away so as to create a warp for the blanket. 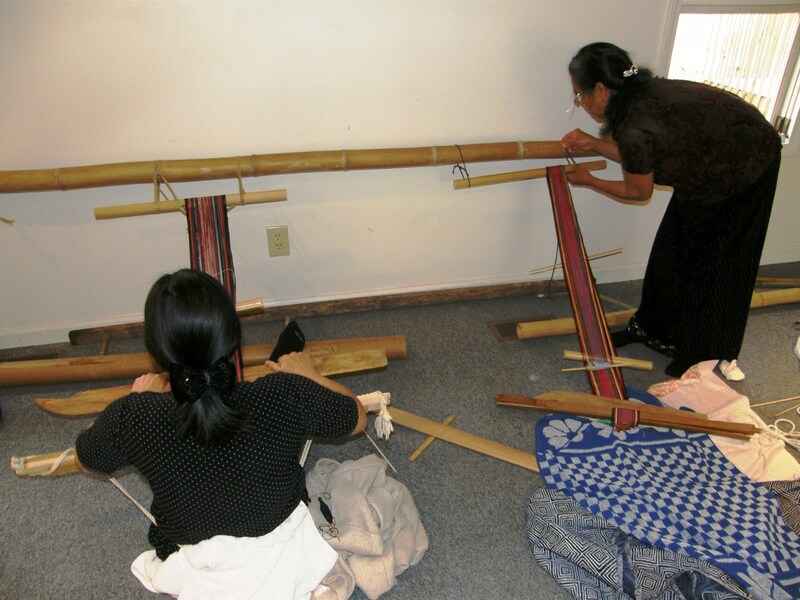 Once the band was finished I would then turn it around and somehow attach it to a loom bar and weave the blanket. I guess I could figure out a way to do the blanket first and then the band but it seems that that would be much more awkward. One day I will meet the weaver and find out! This piece was amazing! I liked it better from a distance as, on close inspection, I saw that the floats were very long on both faces and that it would only really work woven in very fine thread. 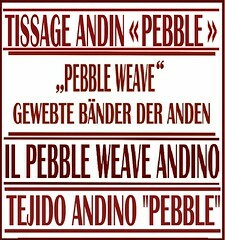 All the weavers present had thoughts on the tribal and/or regional origin of this piece but nothing has been confirmed as yet. Ju brought along her twining frame and is twining designs on the edge of some bags she is making. On the left you can see the design that she is copying. She seems not to consider twining one of her strengths as she often sends her woven piece back to Vietnam with a traveler where her sister does the twining and then returns it. The skirt made for Betsy and my scarf. Pictured above is a skirt which had arrived back from Vietnam the previous day. Ju’s sister did the twining and bead work. This she gifted to Betsy along with a matching blouse. She gave me a beautiful narrow piece to use as a scarf and then had me cut up a similar long narrow piece into thirteen pieces so that she could sew them into glasses cases and pouches. She handed me the piece and a small pair of paper scissors and had me cut it up then and there! I can tell you that I was not really keen on the idea, especially not with a pair of paper scissors, but she trusted me to know the right lengths as I had shown her the small pouches that I had constructed at home. 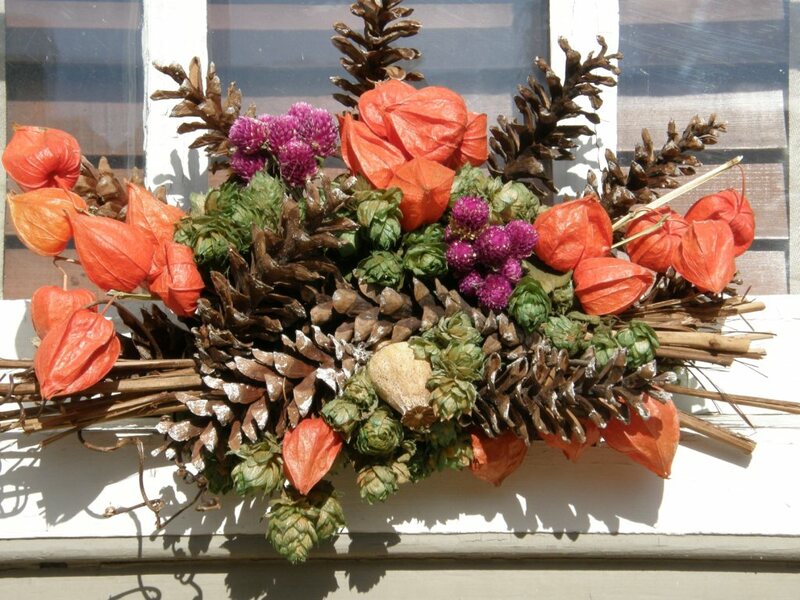 Winter is a time for weaving for Ju as there is no work to be done in her very extensive vegetable garden. I wouldn’t be at all surprised if she has already finished all thirteen pouches. 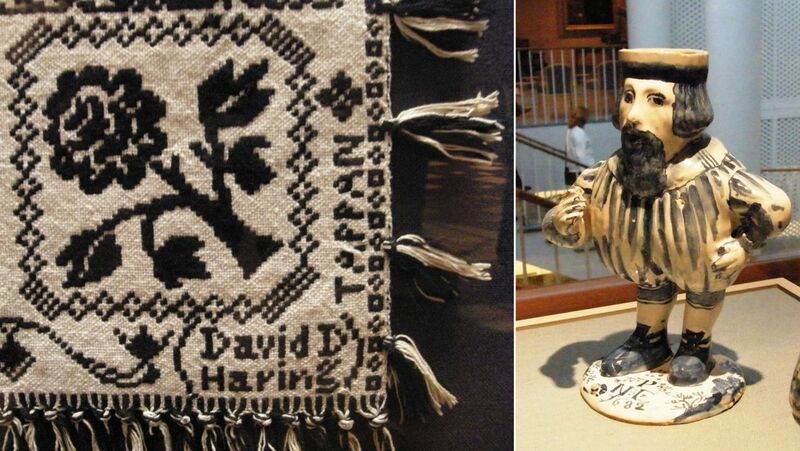 She used the cross knit looping/Van Dyke stitch to edge the bag and embroidered a “running dog” design. There is a video tutorial for the Van Dyke stitch as well as photos of how the Montagnard weavers use it as a joining stitch in this blog post. She is still contemplating what kind of strap to put on it….perhaps a braid? 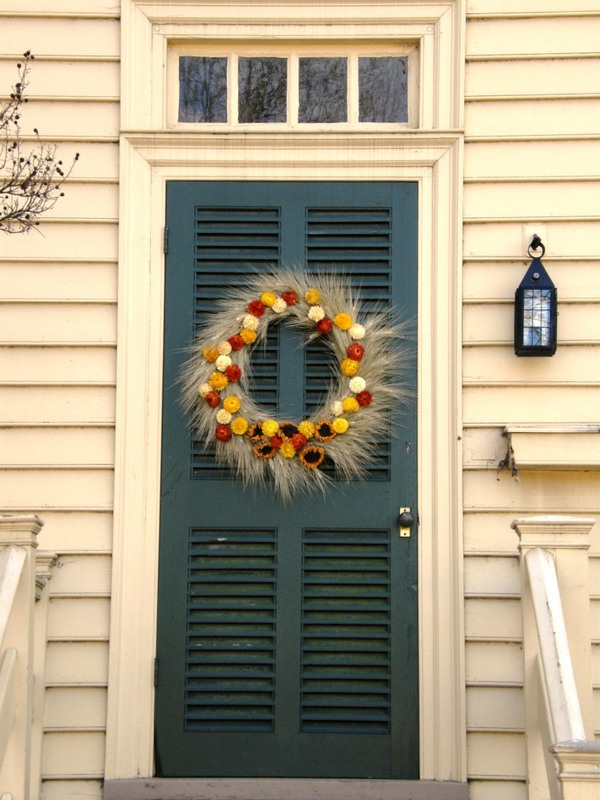 I love the colors and the contrasting edging and tassels. EDIT: I have since heard from Lisa who says that this was never meant to be a tool bag. It turns out that her chosen yarn created the warp-from-hell and that she had had to abandon the original project but found she was able to salvage enough fabric to make something useful. Her less-than-perfect selvedges which resulted from her battle with the warp were nicely concealed within the Van Dyke stitch. Claudia revived the backstrap project which she had warped up ages ago in a combination of variegated and solid colored yarn. She is using a scarf with cord now as her backstrap until she completes this, her very own woven one. I never think about using these variegated yarns and I should really try them out. I have a variegated roving that Lisa gave me ages ago that I need to spin and try out on my backstrap loom. I am pretty much done with the cold weather now. It snowed last night and is blustery and windy today…nasty! I am ready to head back to the jungle and will leave tomorrow. It’s the usual story…standby flights which the airline tells me are fully booked. Fingers crossed that I don’t end up sleeping in Miami airport. 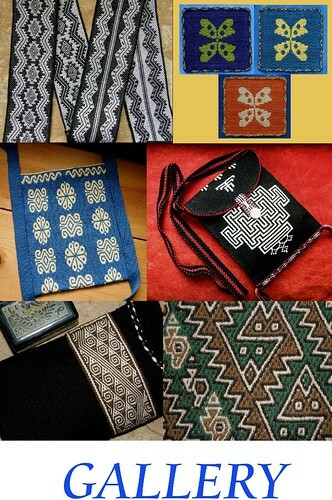 « Backstrap Weaving – Different “tribes”, different customs. 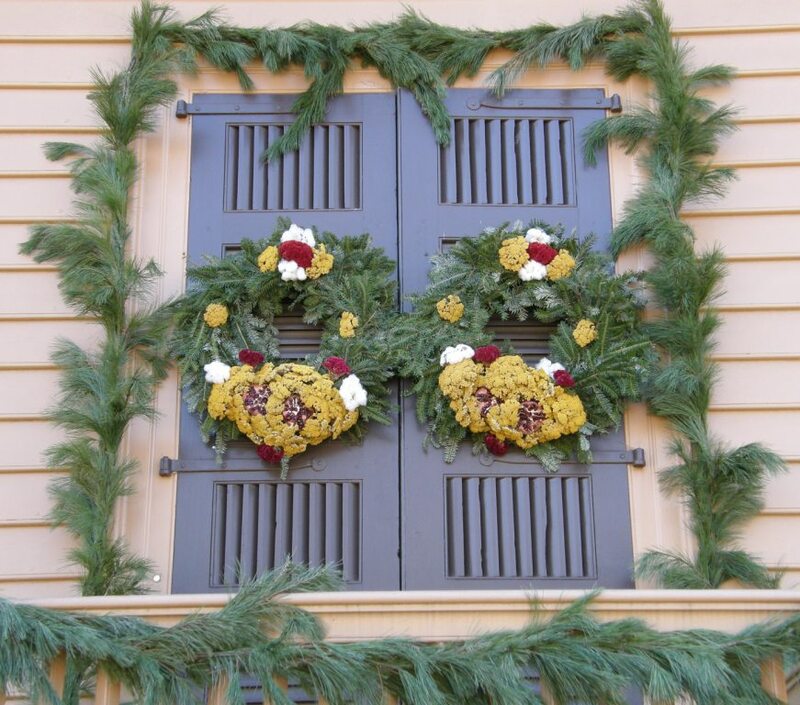 From 18th century colonial Williamsburg to Vietnamese backstrap weaving to a beautiful bag…wow!! 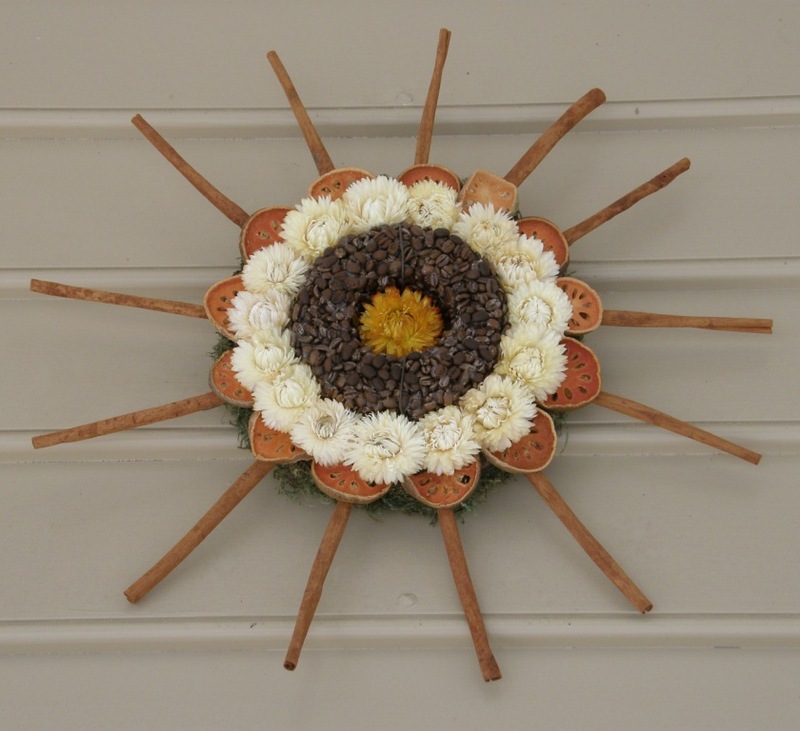 Thank you for your whistle stop trip around the world of folk art! 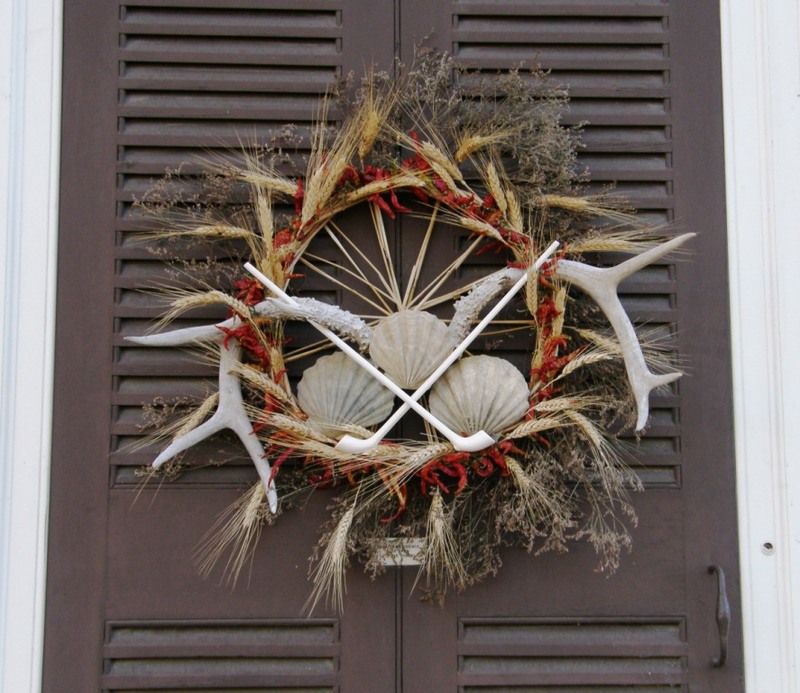 Wonder how the concept of ‘folk art’ overlaps with craft and where it intersects with ‘art’?? 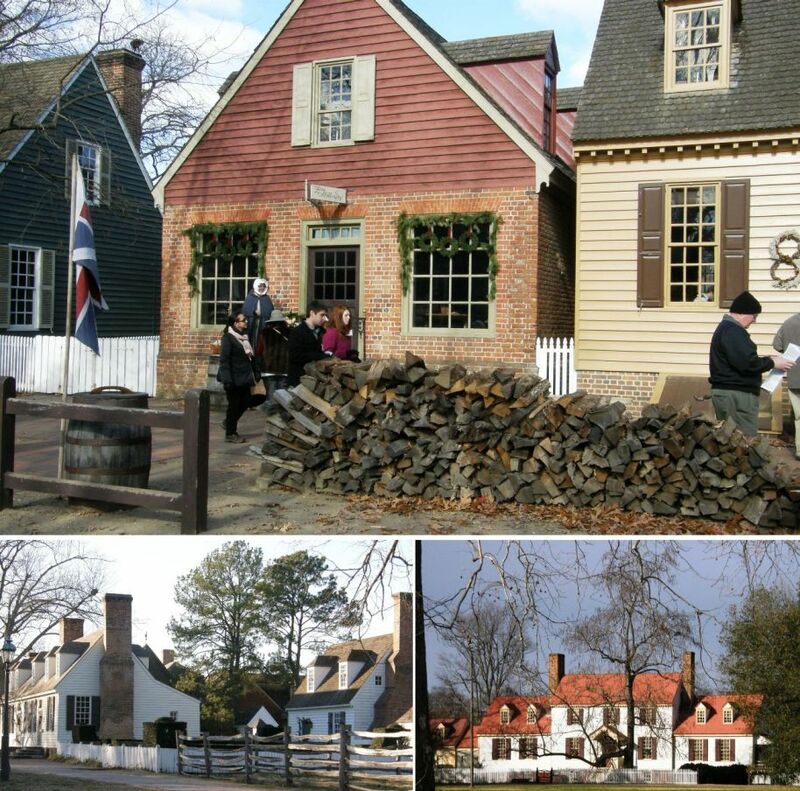 I went to Williamsburg with my family years ago and loved it! I hope to go back again someday. It sounds like it was quite fun, even in the winter months. And as for the picture of the squirrel, I love watching squirrels whenever I see them, even though I have had them where I live all my life. They are just such interesting critters! Safe Travel Lavern, and Thanks for another exciting addition. (I got worried last Thursday…) will see you next in our Santa Cruz, where it never gets Really cold. Job Well done Dear friend, this is a great pictorial analysis. Thanks for taking us with you in this journey. 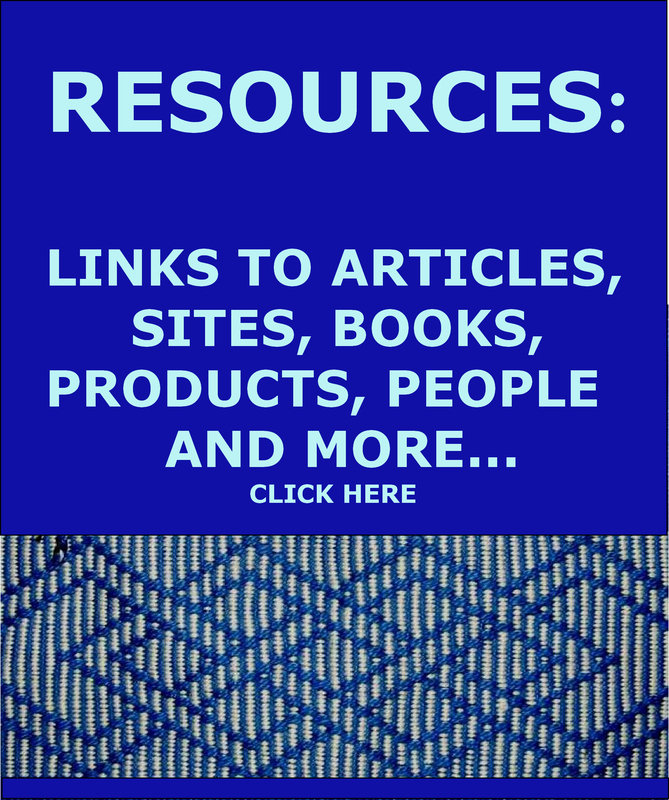 Thank You very much for this Blog! I like the story, the photographs, the information, the traditional costumes Wonderful!!! 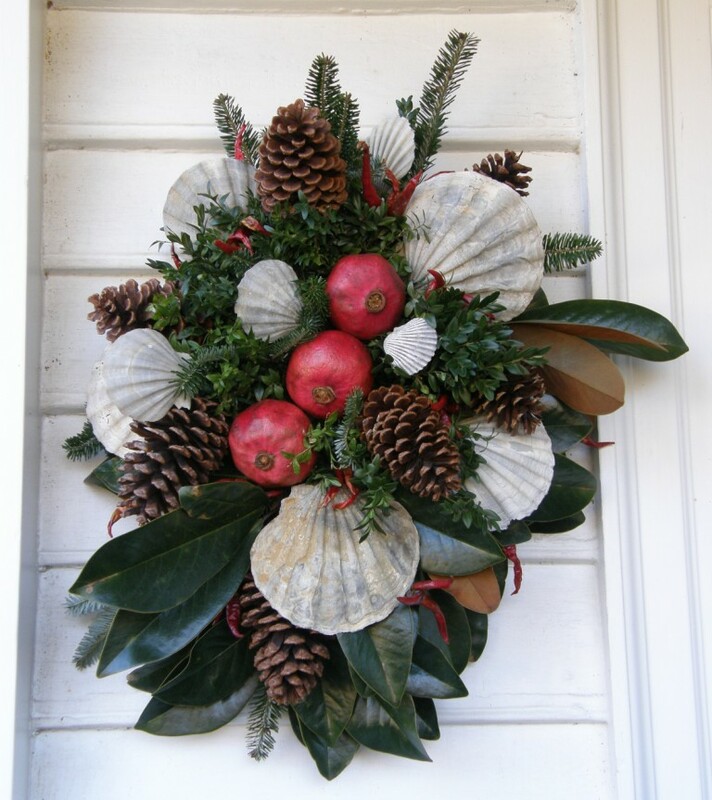 Wisch You a good Christmas time and a Happy New Year. A beautiful summary of a wonderful week!….”I want to go to there”…again and again! Thanks for sharing the journey Verny! Lavern, Thanks for sharing your adventures and bringing the 18th century experience closer to home for us, as well as the Vietnamese weavers’ projects. Happy Holidays! Hi Laverne! It was interesting seeing old Williamsburg and the Vietnamese weavers again. 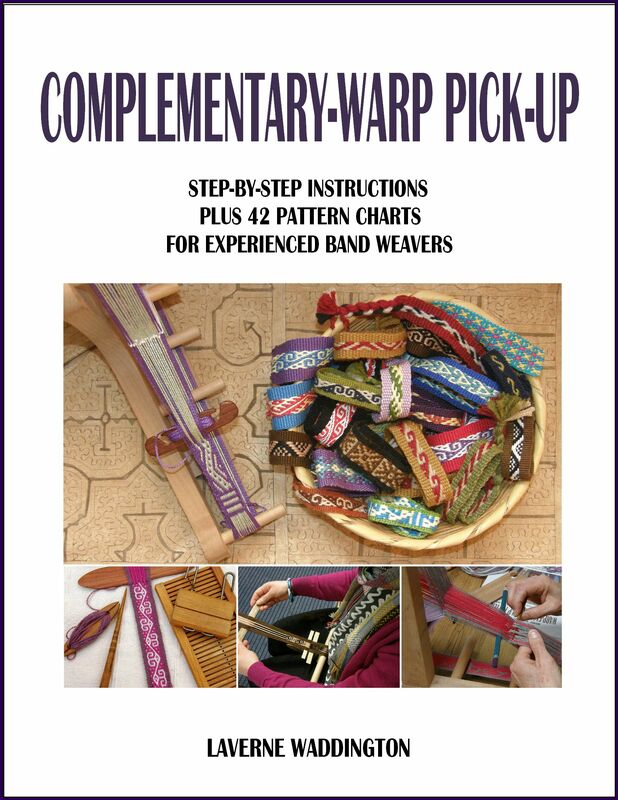 Is it possible to weave double weave on a backstrap loom? 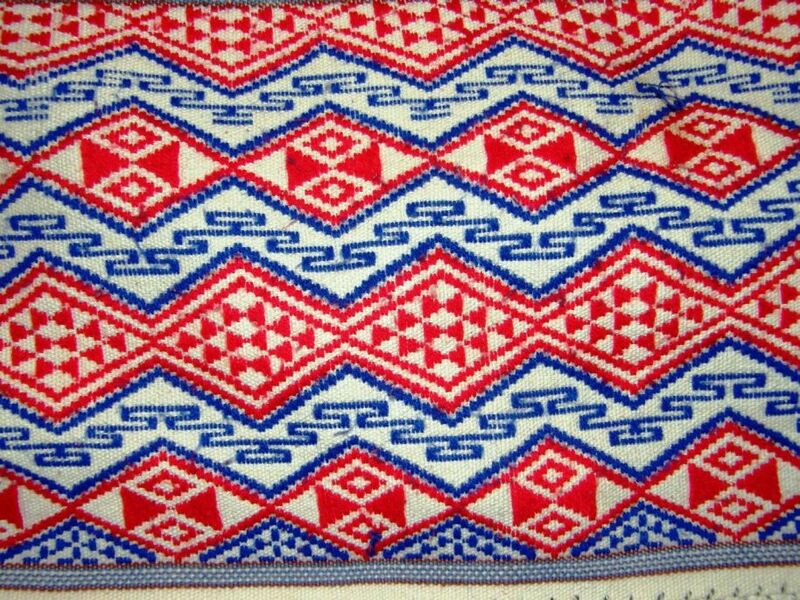 Or, did the Vietnamese weavers weave two panals and sewed them together? It looks like they did some twining before starting they started the band, or maybe I’m mistaken.